Brantford – Wilfrid Laurier University’s The Yellow Brick Wall gallery at the Brantford campus will feature an exhibit titled Copper Mine. The exhibit runs from March 6 to May 23, 2017. The artist behind Copper Mine is Brantford resident Heather Vollans. 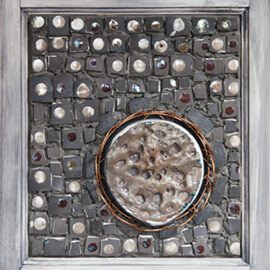 Her exhibit features mixed-media pieces created from salvaged and reclaimed materials. Copper Mine questions the impact of copper mining on human health and the environment. The exhibit features 20 pieces of art, combining copper pipes, sheets and wire with other material. Additional works highlight the colour of copper and speak to mining-related issues. “I am interested in exhibiting work which speaks to the human condition — our relationships with one another, our reactions, our emotions, our lives — and how we impact and are impacted by the environment around us,” said Vollans. The Yellow Brick Wall is the exhibition venue at the Brantford campus of Wilfrid Laurier University, located at 97 Dalhousie St. It is designed to provide appreciation and enjoyment of Canadian art to members of the Laurier community and beyond. The Yellow Brick Wall aims to contribute to the growth of Laurier students, encourage dialogue and reflect the diversity and culture in the Brantford community.